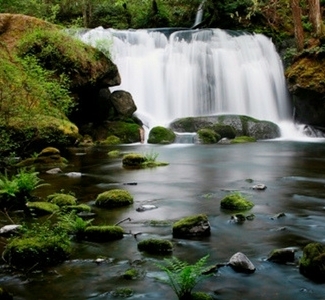 You'll find a beautiful park, a lovely creek, and breathtaking falls along 5.5 miles of scenic trails. It has an interesting history that dates back to 1890 which involved the vision, hard work and diligence of many local philanthropists and volunteers to establish it. Throughout it's evolution, many trails, plantings, play equipment, picnic shelters and wooden bridges have been donated by private individuals. A sandstone bridge was later built in 1939 and became a landmark of the park. Unfortunately, on June 10, 1999, a fire devastated the park. This led to a project that has taken decades to restore it's beauty. Today, the park includes a fish hatchery, fishing derby pond, multipurpose fields, and outdoor basketball court, playgrounds and so much more!